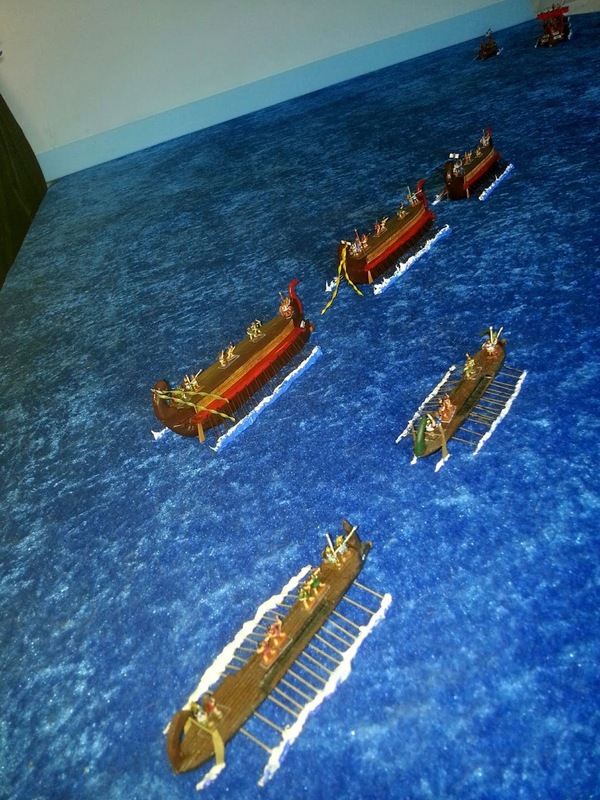 The obstreperous Sidetans are to be put in their place by a Seleukid flotilla. The Nine'Poseidon' leads two Fours, Apollo and Arrow and two 'friends' the lembi 'Speed' and 'Quick. 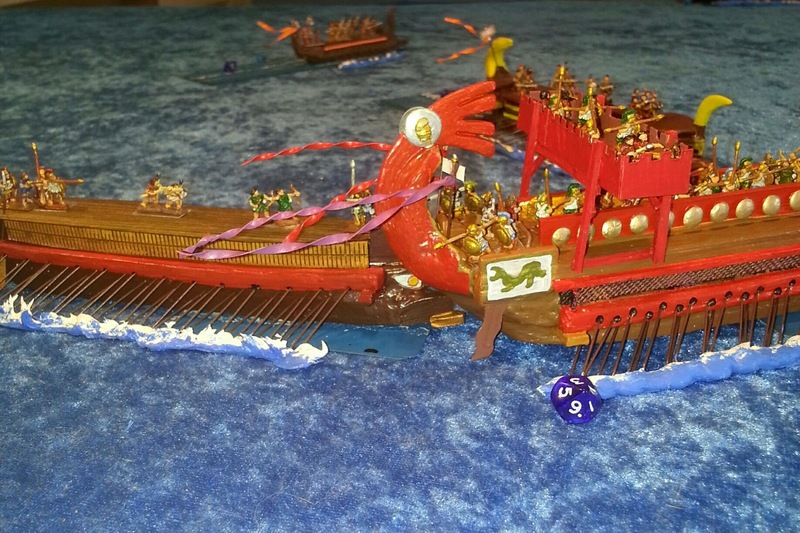 Poseidon is stuffed with troops and 4 catapults (3-span). Each Four has a 3-span in the bows. 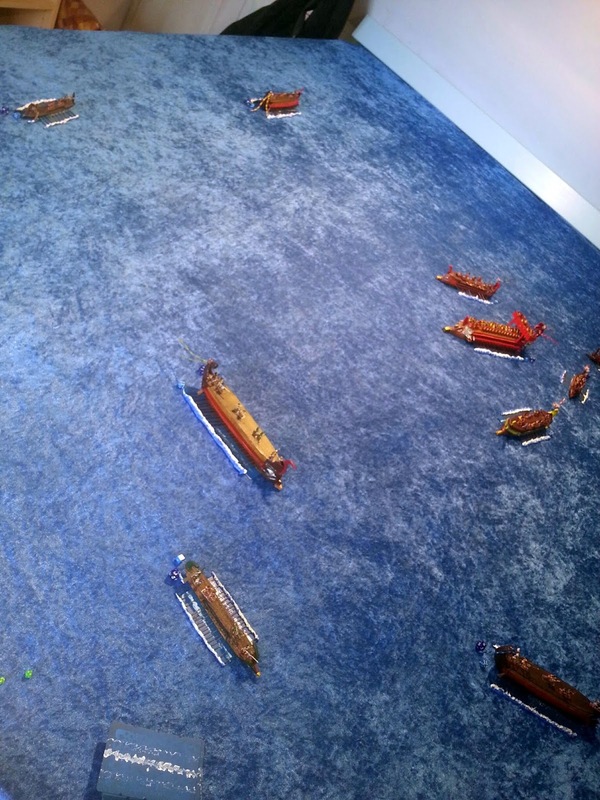 The Sidetans have no big ships but they have fast ones. Threes are 'Alacrity', 'Dolphin' and 'Medea'. Also two sharks, 'Biter' and 'Dangerous'. 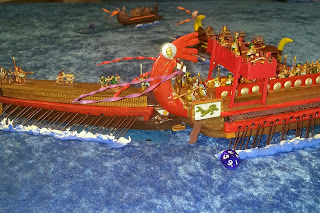 No catapults and less deck fighters. The Sidetans scatter while the Seleukids stay in a block. The Seleukids have to decide which group to go after, or all? Arrow makes a charge at Alacrity but misses. Alacrity swoops behind Arrow to get into a dangerous position. 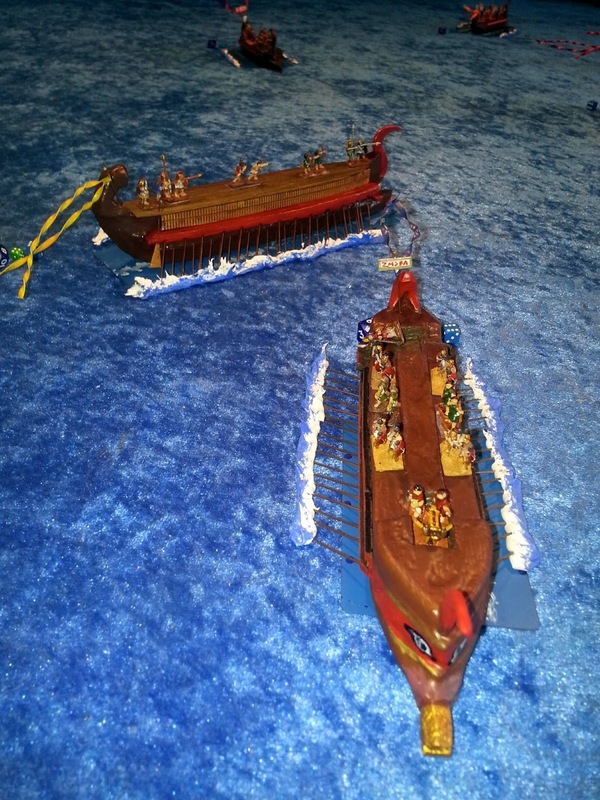 Arrow is now directly behind Poseidon. Best possible position. Arrow gets to go first ! Good crew and speed. 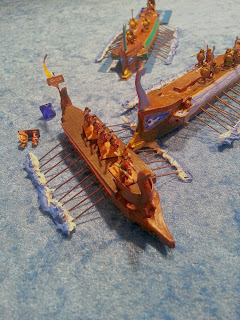 It lines up on Poseidon's stern and the oars dig deep for a charge! 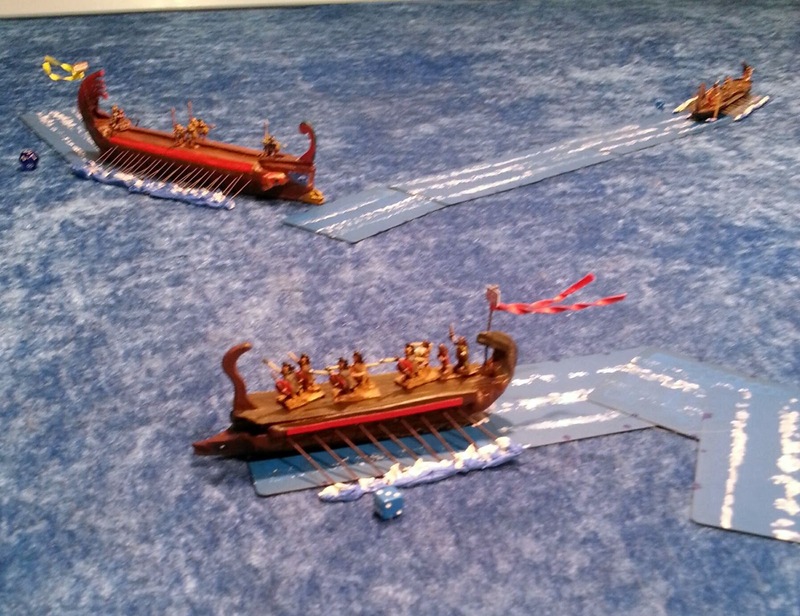 Some missiles fly over to Arrow from the Seleukid flagship but the damage is done. 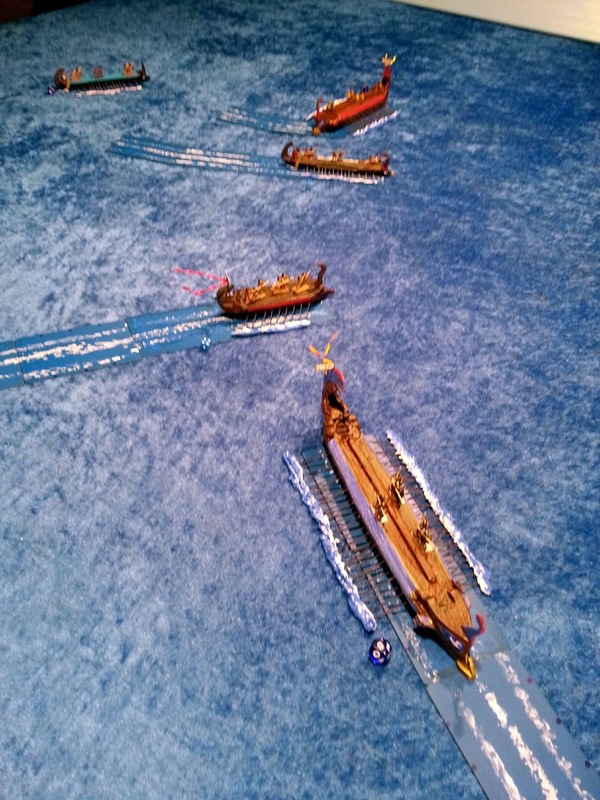 All ships scratchbuilt 10mm scale. Figures Magister Militum. 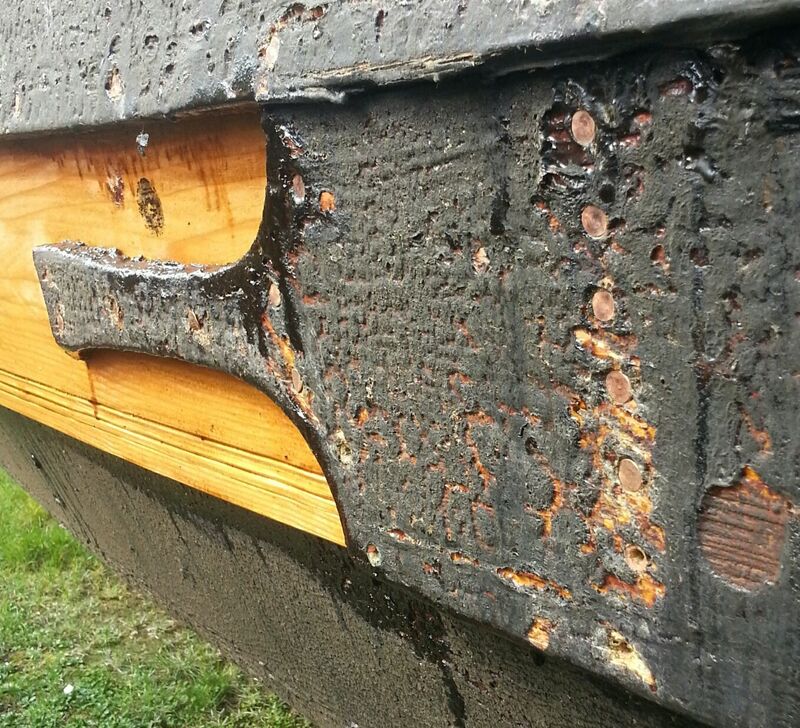 Replacing planks in shell-built hulls is tricky. Of course it can be done and was a common necessity. 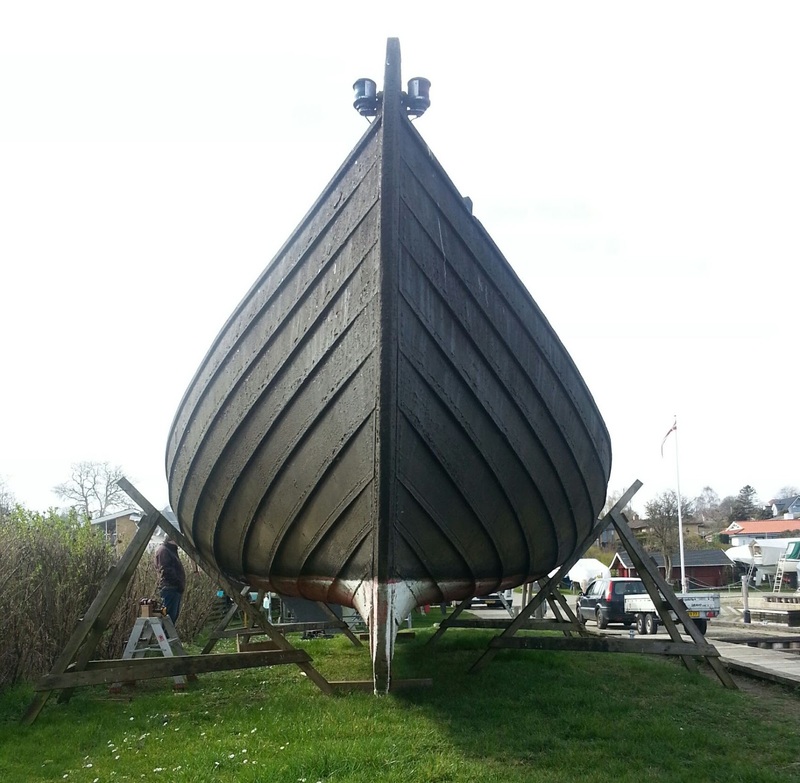 Nidhug is a Gokstad-type Viking Period ship now more than 20 years old. It is not a narrow warship but a general purpose hull which is a bit deeper and rounder than one would like for fast rowing. 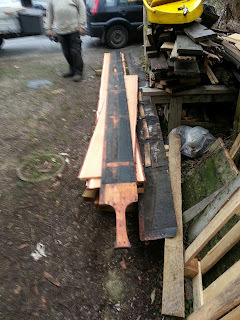 Several planks need replacing having begun to weaken. 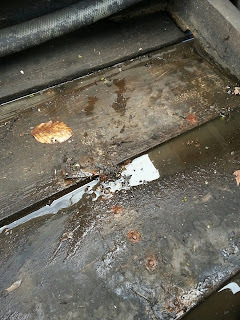 An upper plank needs replacing. The hole was easily knocked through after the plank was taken off. Planks removed reveal the lightness of construction. It is the edge-fastened planks which give th ehull most of its strength, not the internal fittings. From the inside..th eupper strake nice and light coloured is the one shown rotten above. The clamps allow th eplank to be set fast in place before nailing. The floors and knees defining each sess or rowing place (interscalmium on an ancient galley). The cross-timber is a tofte, equivalent of a zuga. 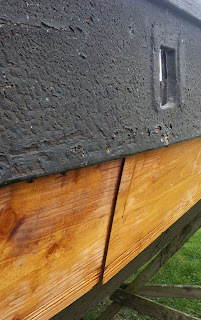 The planks are fastened with a nail/spike that is driven in from the outside and rivetted over a rove or washer on the inside, so joining two planks together through their overlapping edges. This is clinker construction. 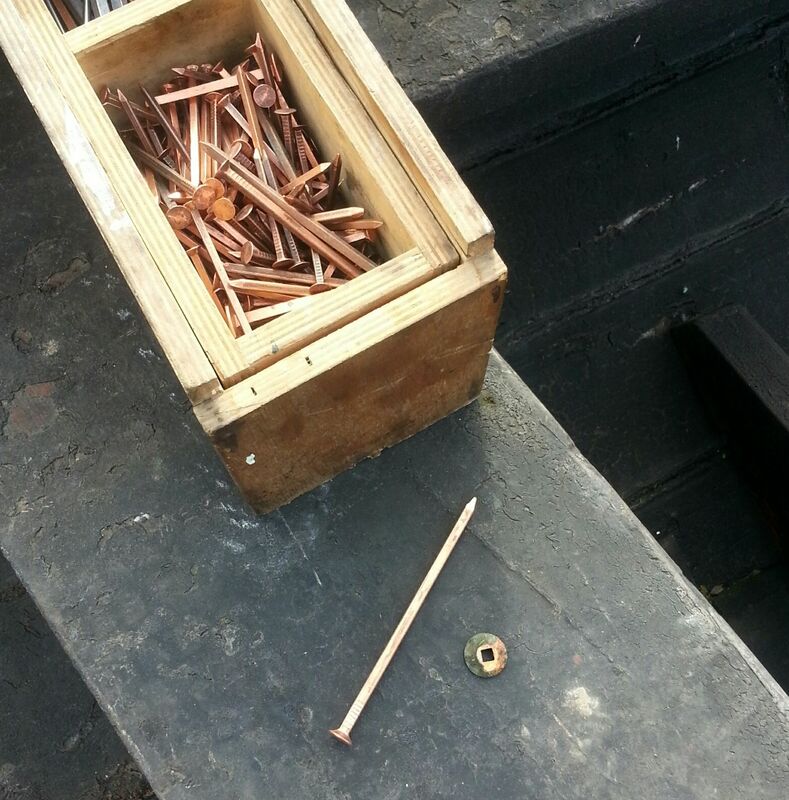 Copper spike and rove. 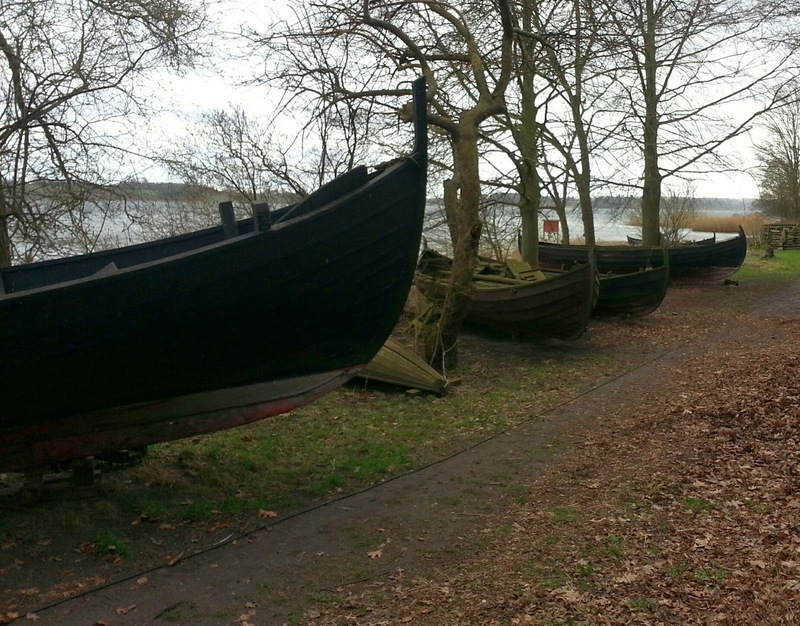 These woul db eiron in the Viking Period. We use copper for security and because hand-smithed boatspikes cost a lot of money and are not always available. Over-lapped joint with nail heads visible. 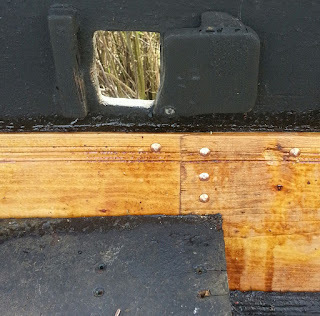 They ar ein the old holes in the existing plank. 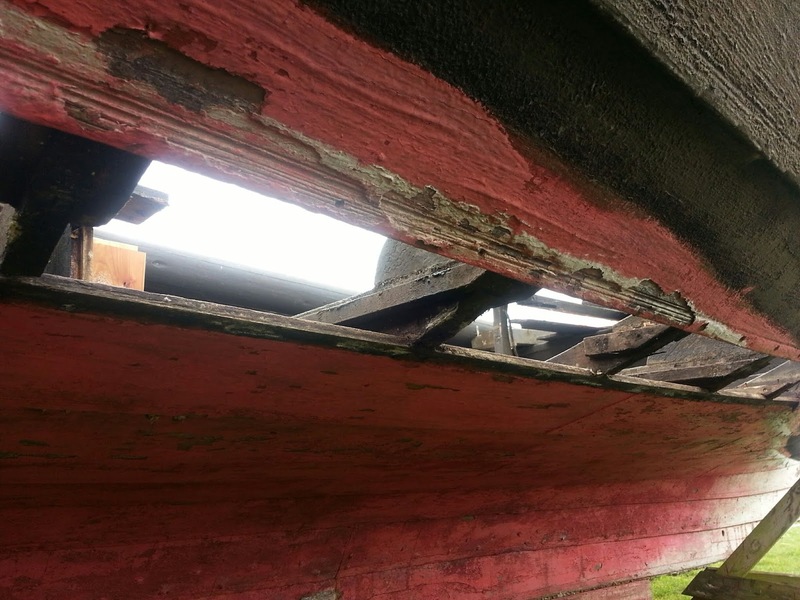 From the inside you can see the overlap joint of th enew and old planks. The spike end is rivetted over the rove. 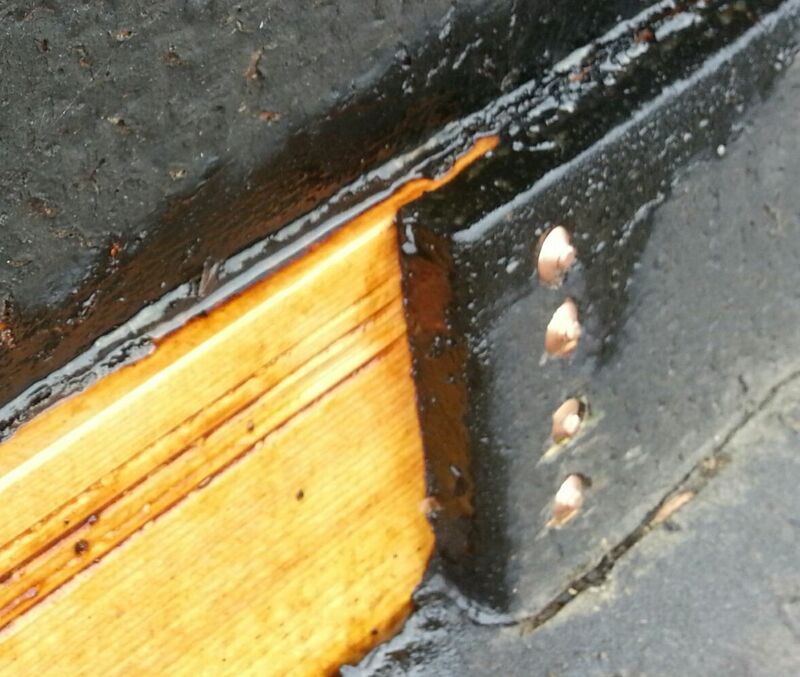 Another type of joint is the scarf which overlaps two thinned-out plank ends to maintain the single thickness. This is nailed close along its length. 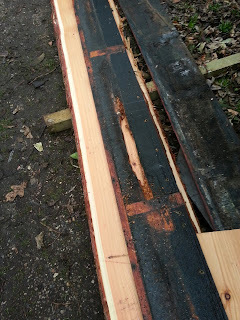 The other end of the lap jointed plank. Looks great. Note lovely texture from years of tar application on old planks. The replaced planking looking nice and new and neatly fitted into the hull. 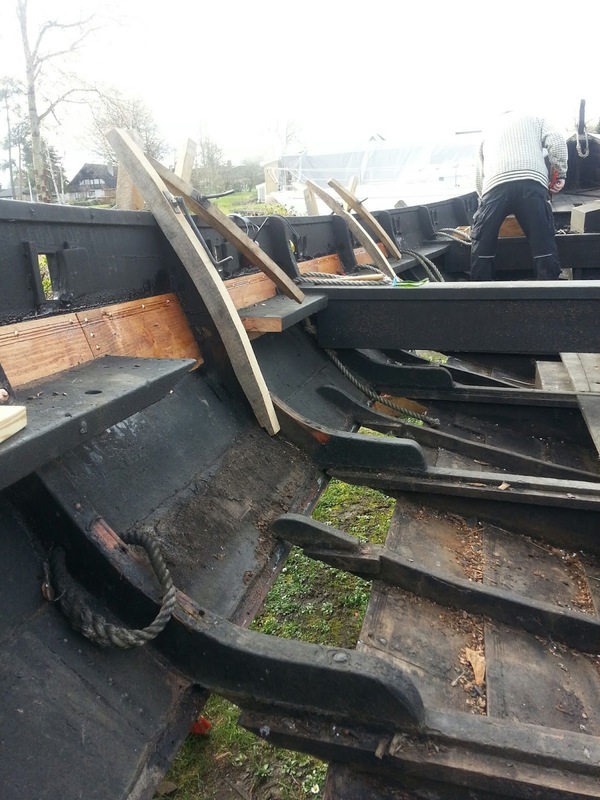 Replacing planking in a draw-tongue edge fastened shell like the ancient war galleys was also tricky. Even more tricky than this. I will do a note on that to follow. 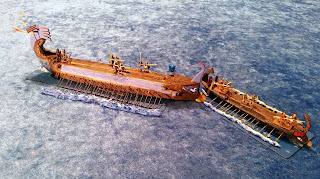 Galley fleets were held in neoria - shipsheds, when not in use. 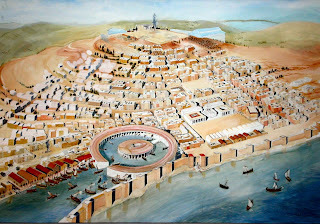 Neoria were one of the largest investments and were some of the most widespread and extensive installations in the ancient world. 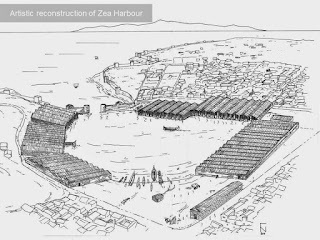 Strabo tells us that the many tiled roofs of the neoria which housed the Rhodian fleet looked like ploughed fields of red earth extending around the harbour when viewed from the acropolis hill. Every galley had a roof over it through the 'off' season from October to April circa. 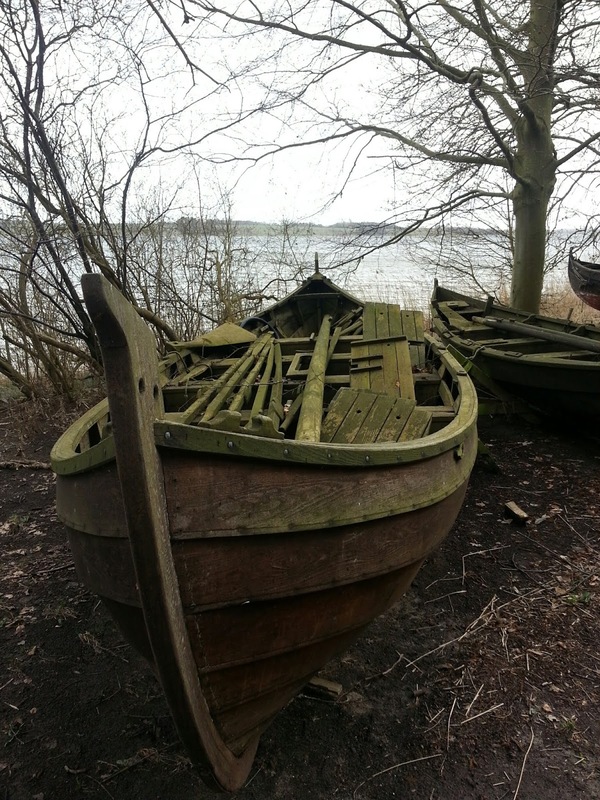 They were dragged out of the water up slipways and propped-up on stays. 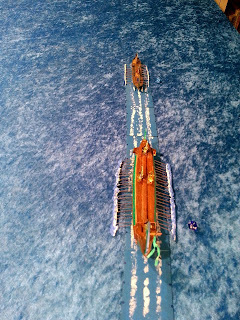 Sometimes the shipshed could house two ships in file or several small ones side-by-side. 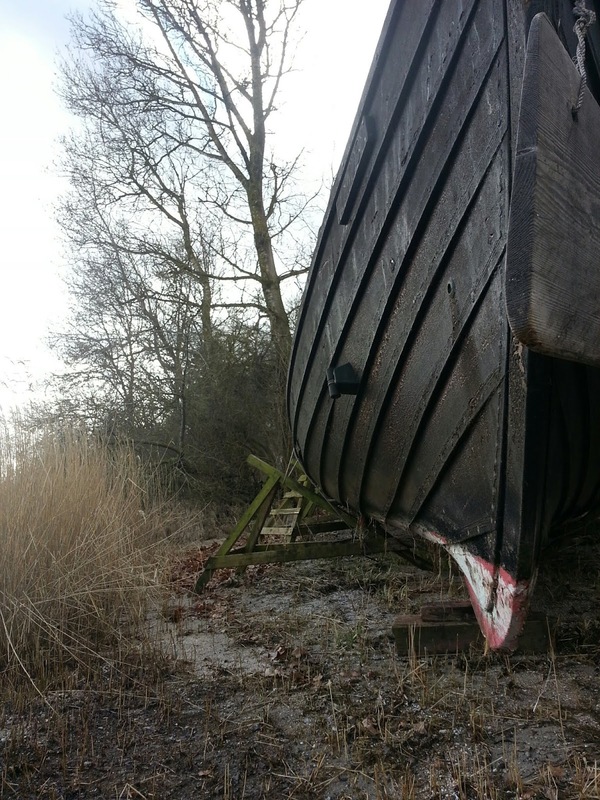 The tiled roof was supported by stone columns and the slipway had transverse timber sleepers installed to allow the keel to be dragged up. 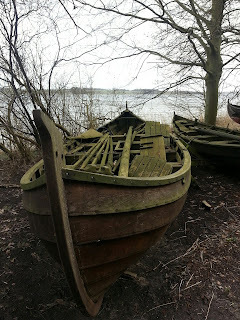 Some shipsheds may have had an extension for storage of gear, in other places the removeable gear of the ships was stored safe and dry in special magazine. The naval shipsheds were sensitive military areas and at least Rhodes prescribed the death penalty for unauthorised entry. 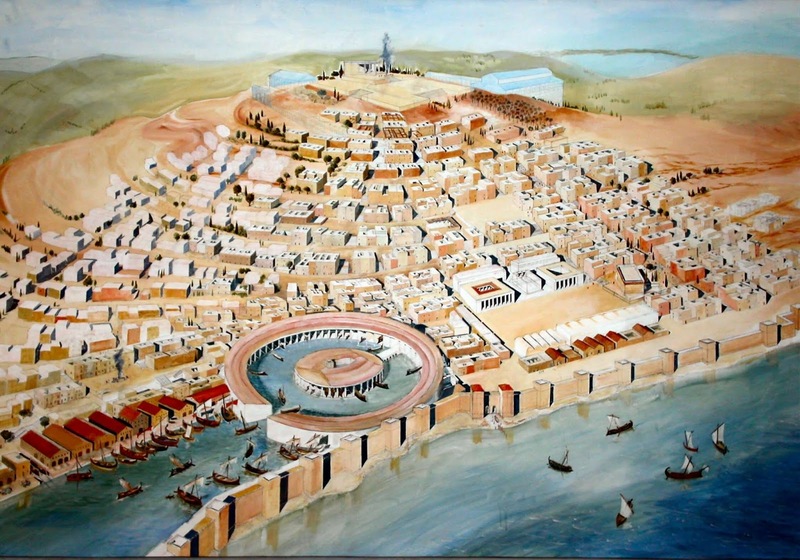 At several places we know they were walled-off or located on islands. 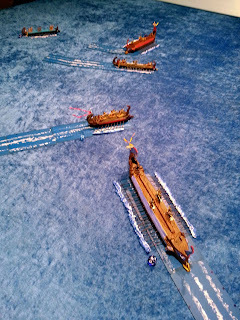 Shipsheds were necessary because war galleys have a light construction which is very sensitive to damage by marine organism infestation. 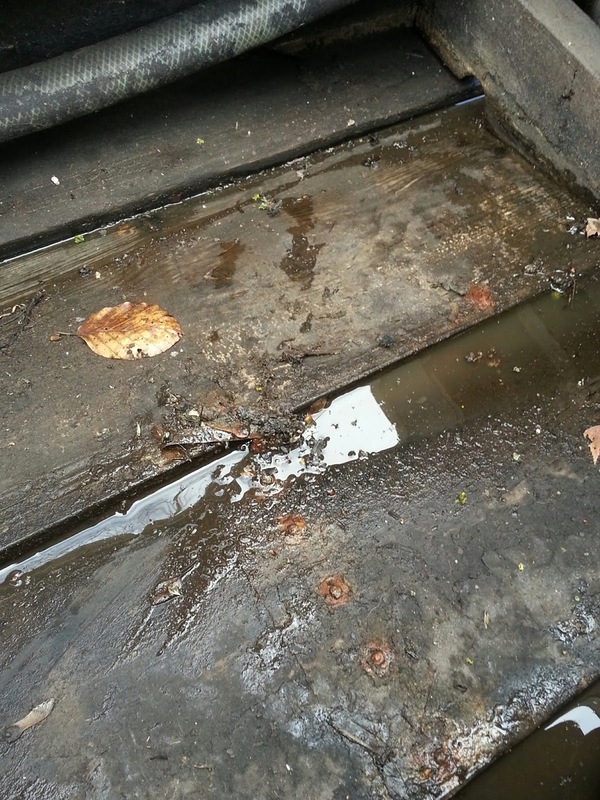 Algae and encrusting organisms and boring organisms can infest the hull below the waterline and lead to rot and weakness. 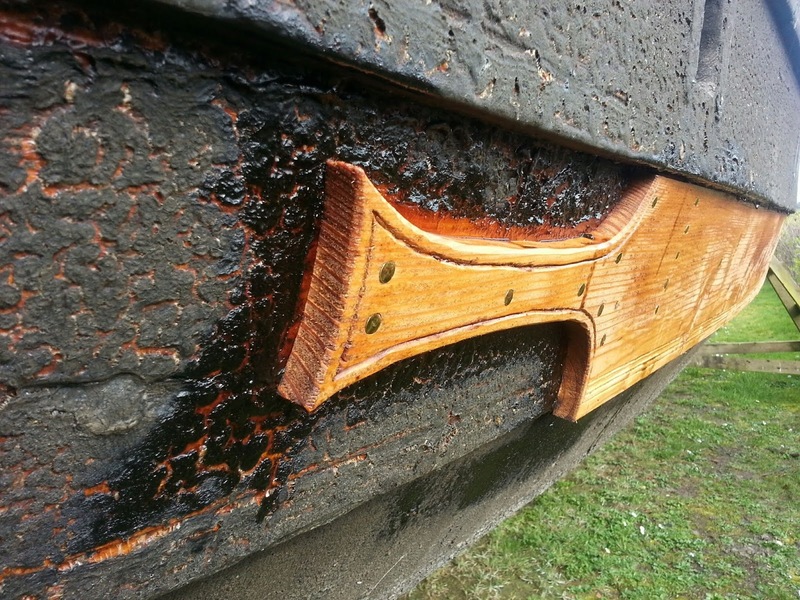 Ancient shipwrights had no anti-fouling paint. Freighters could sacrifice speed by adding lead sheathing but warships could not afford to do this. 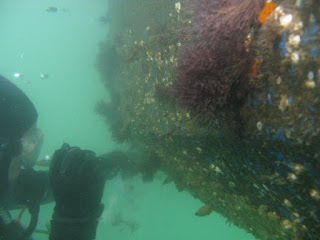 Not a coral reef... extra weight and drag from marine fouling. Ship needs slipping and cleaning. Another factor was the conditioning of the timbers. 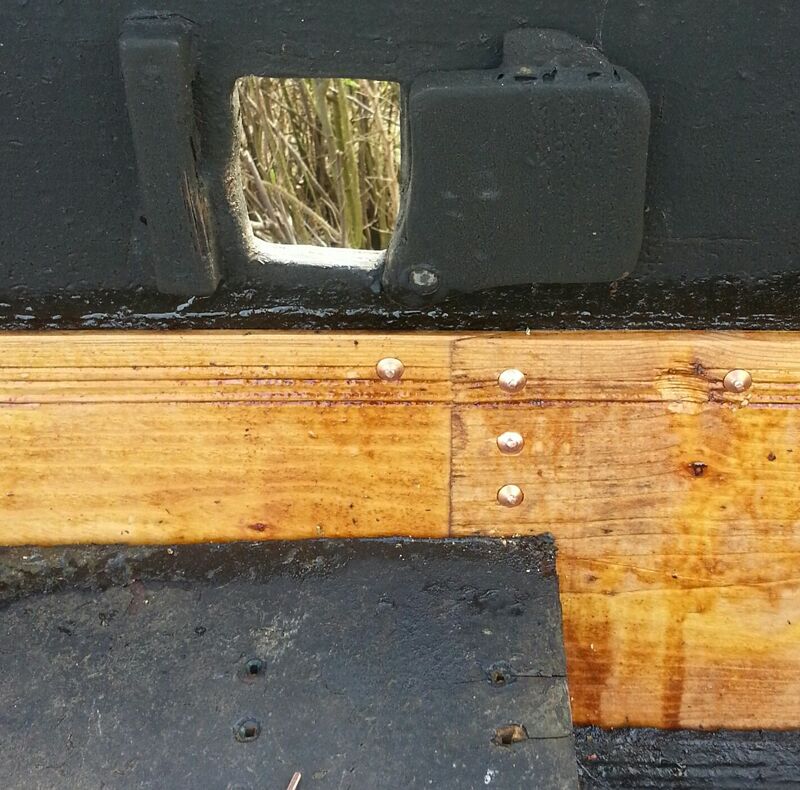 A galley has a limit to how far the timber should be saturated with water. Too little means the joins and joints are not fully closed below the waterline and the ship will take on water. 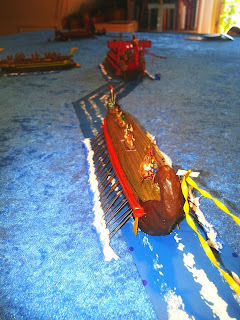 Too much means the ship is heavier than need be and in a rowed war galley this can hinder combat performance. A good coating of tar, maybe resin, maybe a proprietary recipe known to ancient shipwrights, was laid onto the timber below the waterline to stop the timbers getting waterlogged but at some point the crew would recognise their vessel had lost its edge. Periodically throughtout the sailing season a galley could also be laid up in the shipsheds to dry out. 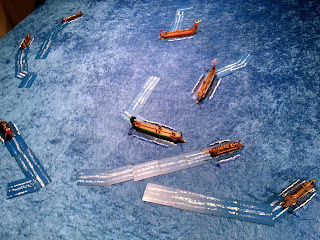 Sometimes when stationed far afield the ships could be slipped on a suitable beach. Viking ships are also galleys. 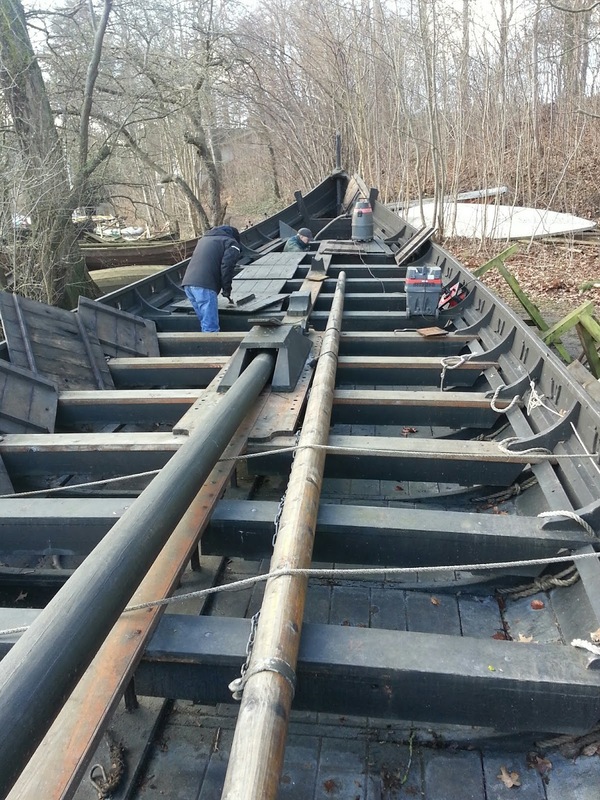 Now is the time of year when ships must be readied to go into the water in April. 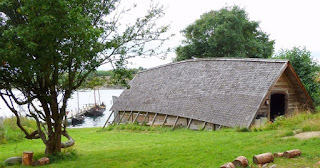 Viking had neoria, they had shipsheds. The Nordic version is a naust. They have the same basic function as Mediterranean neoria. 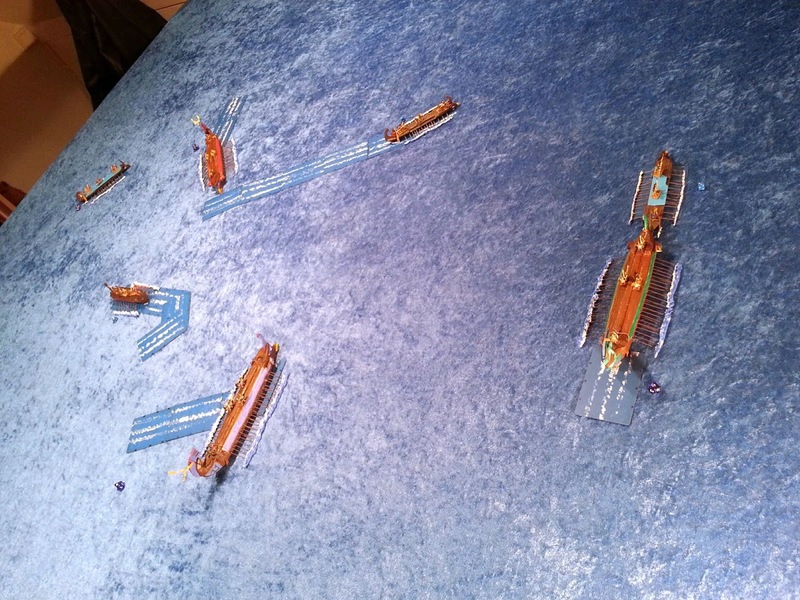 This weekend our ship league began this work. 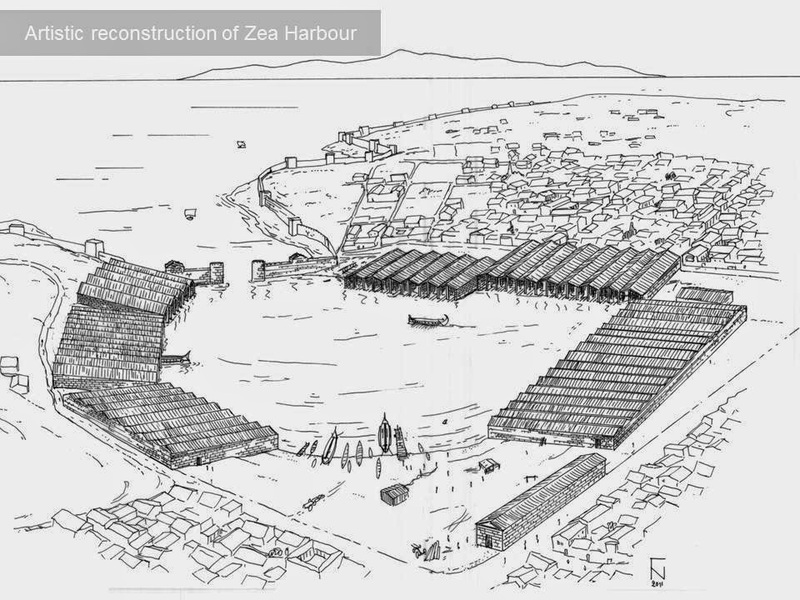 A direct analogue of what must have happened around the shipsheds of an ancient naval base. 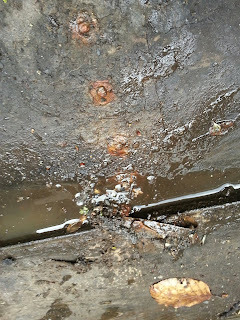 Everything below the waterline must be cleaned and tarred. 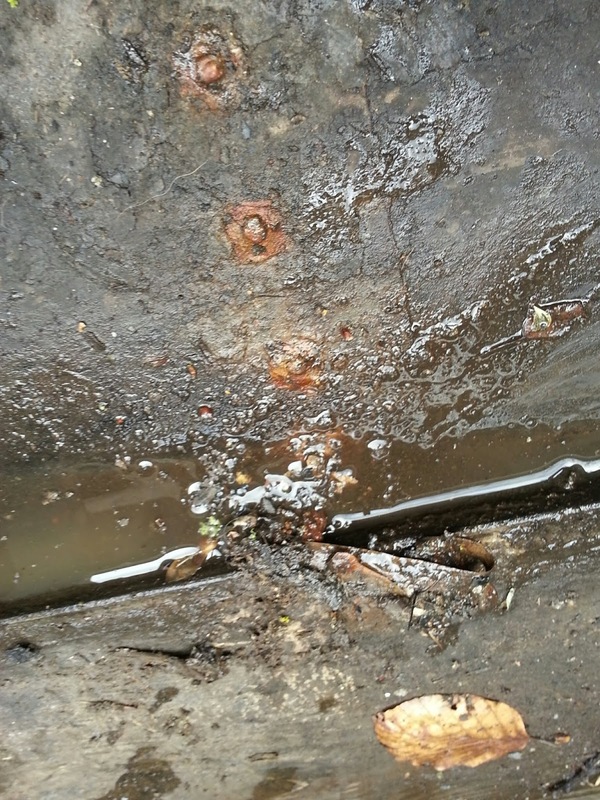 Everything above the waterline must be cleaned and tarred. 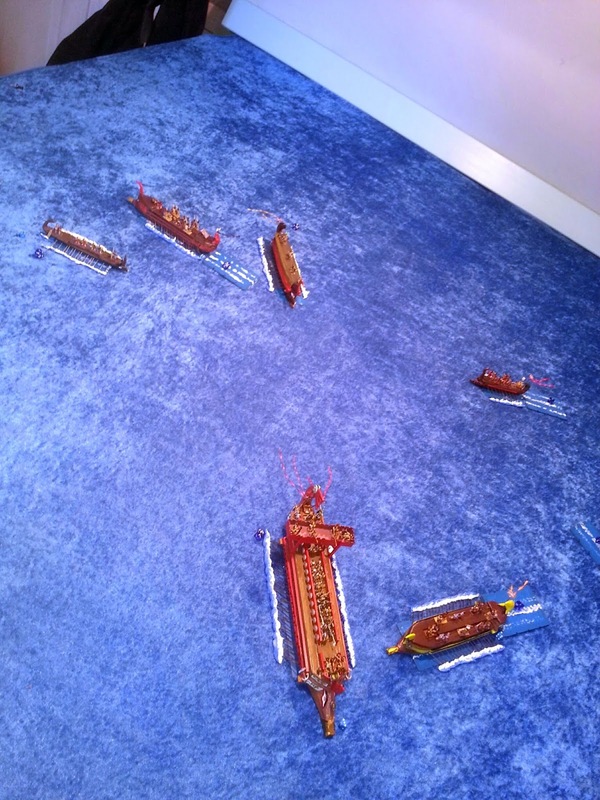 Ancient naval galleys would have their ornament and decoration refurbished. 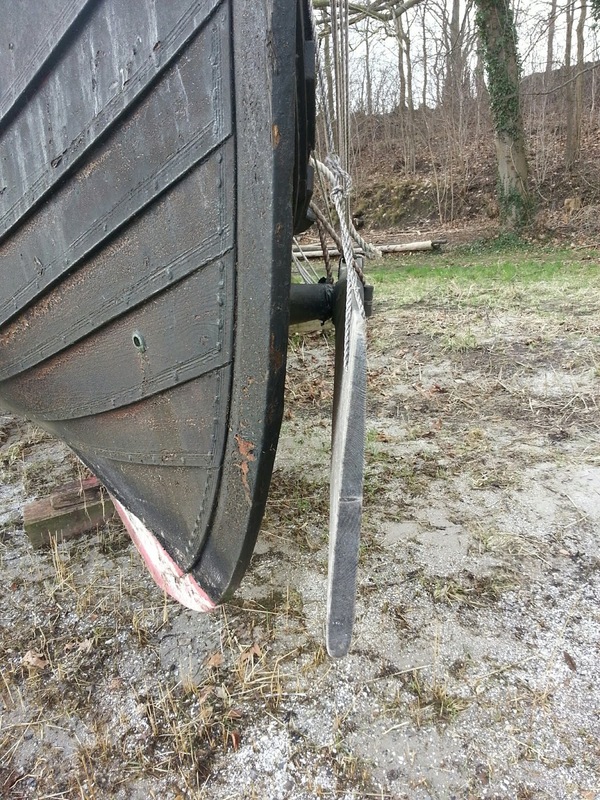 The bilges would be cleaned. 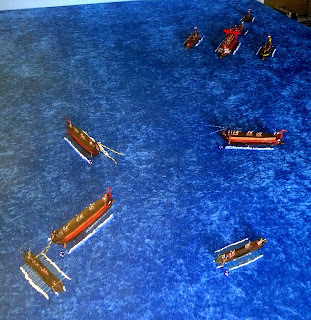 Multi-tier galleys would have the accumulated debris from hundreds of men in the hold and bilges. 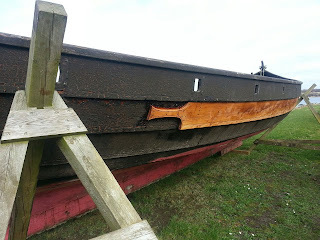 Whilst it is unlikely that anyone actually crapped inboard as writers from the 19th century thought, the odd case of Trojan Revenge or seasickness would add a certain piquancy to the residue therein. Slime, leaves, old water etc. At the same time the thousands of draw-tongue fastenings must be inspected and repaired if found wanting. The roves of nails holding the clinker-built ship together. Analogue of draw-tongues in a galley. 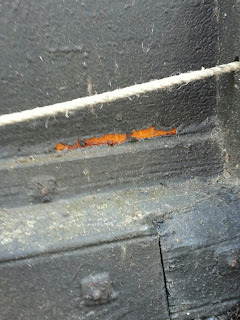 Some corrosion here. Damaged planking must be identified and changed-out. The hull should be perfect for the coming season. Rotten area of plank. New wood underneath waiting to be cut and planed to shape. 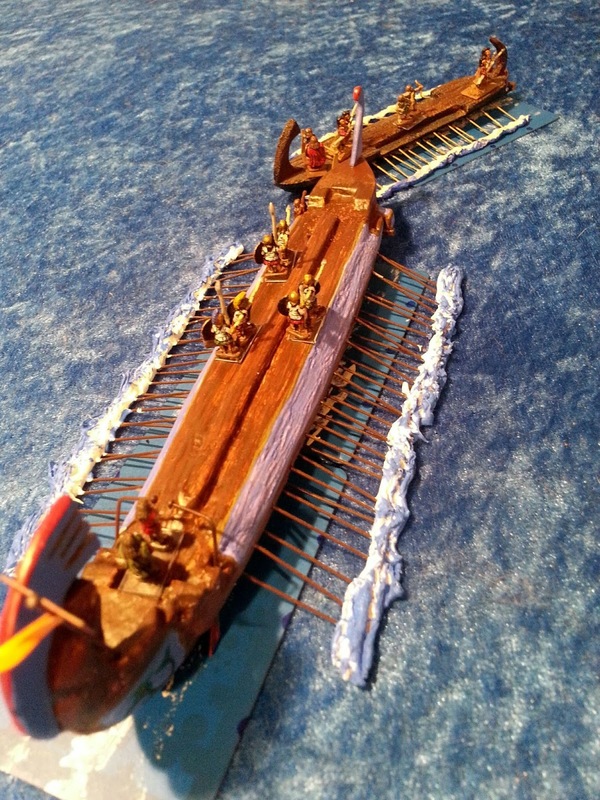 Our ship league has had 10 or so large and small wooden Viking ships over the years. Unfortunately the local authorities did not permit the building of shipsheds of any form so they stand out in the weather. Sometimes covered, sometimes not, because moisture needs to be able to disperse from a wooden ship. Sadly, some of the older ships, constructed as projects in cooperating with the local authroities cannot be maintained any longer. 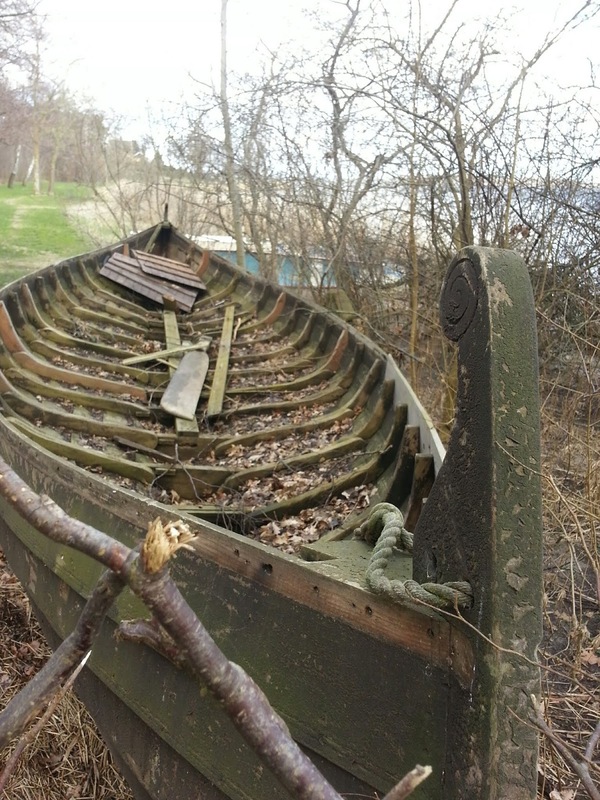 It is a big undertaking to look after a wooden ship and few people will or can take them on. Certainly, we have found, the local authorities will not do it and will not support us in doing it either. 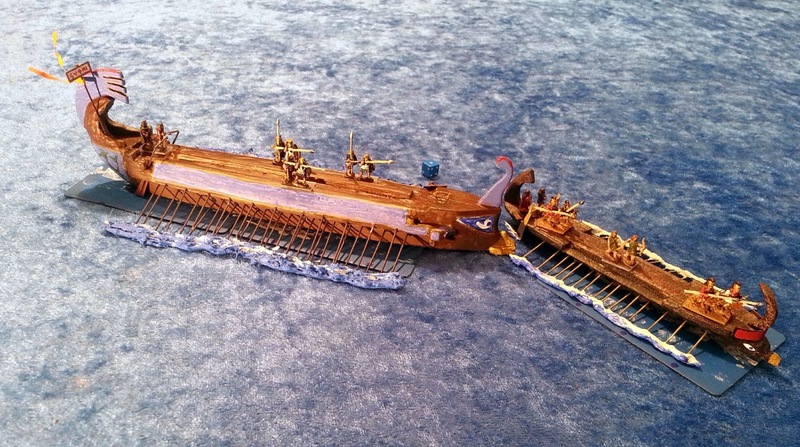 The famous Marsala ship from Sicily nearly met the same fate in the 1990s. 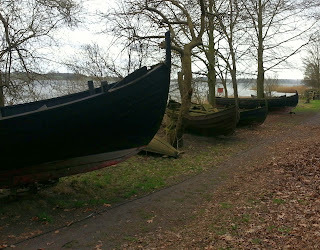 Money limitations and local politics nearly led to this ancient ship - the only remains of a galley up till then - being dumped. Its excavator, Honor Frost, even wrote an 'obituary ' for the ship in 1997. An additional factor which I will also discuss later is the effect of sun. It can be alarming in north european latitudes but in the Mediterranean even worse. 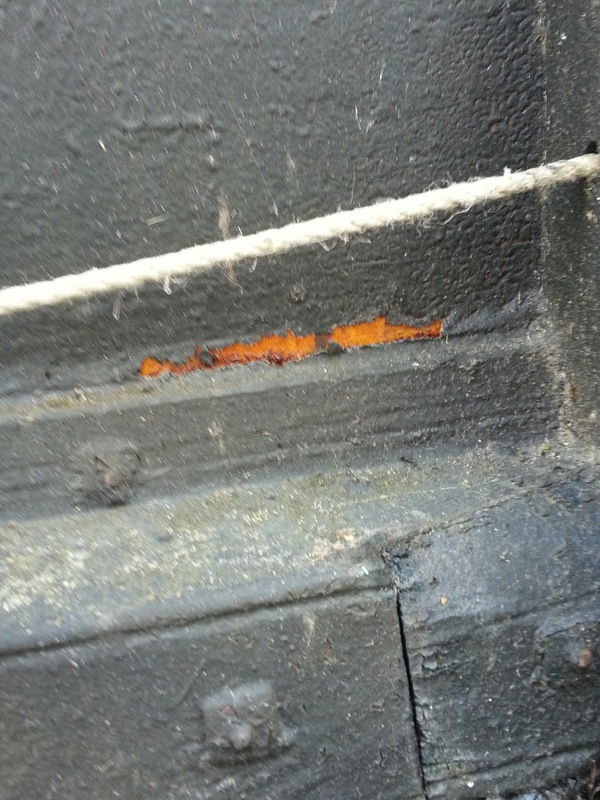 The UV in sunlight degrades the structure of wood. 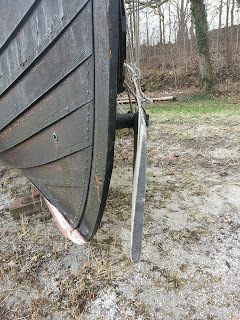 A view of the steering oar to show how slender it is. Also the securing joint. 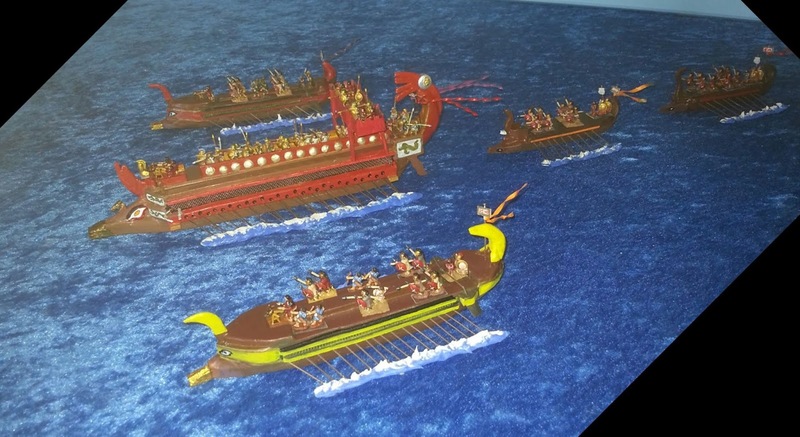 Homer's 'black ships'. Beneath years of tar a glimpse of the preserved wood in its original glorious gold. 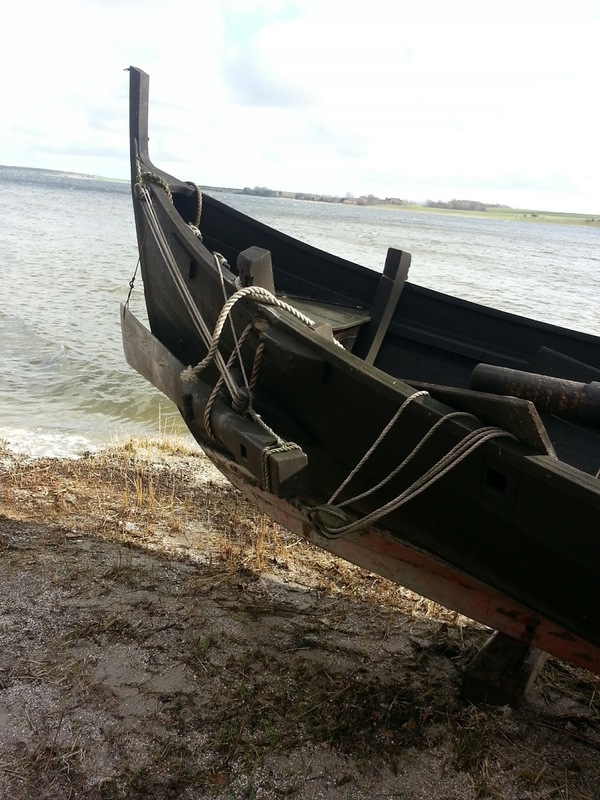 A longship on stocks by the waters edge...some spring cleaning and she will be off again. Three pirates still on the loose. 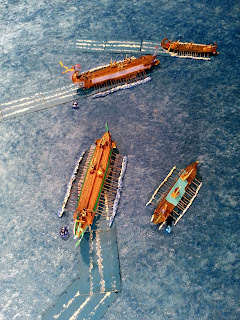 One pristis(centre) is almost within striking distance of leaving the table for a victory point. 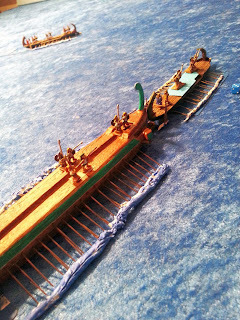 Green trihemiolia disengages after a perfect stern attack. 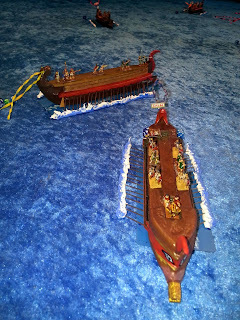 Red trihemiolia is split between going after the runaway pristis or after the lembus crossing his bows. But actually the blue trihemiolia shoots across the seascape to look after the pristis. Green gets free of his prey and is also available in the table centre now. 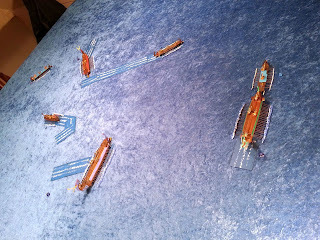 Red takes the easiest option and acelerates to take the lembus broadside-on. 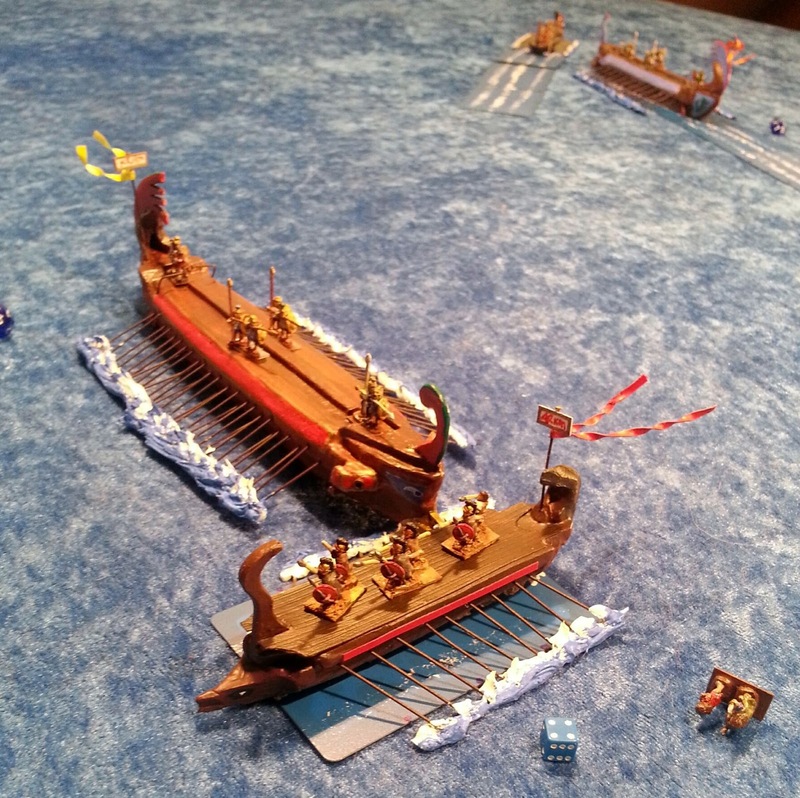 The pirates continue their run of bad dice and once again the command element is flung overboard by the impact. 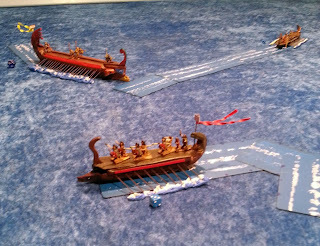 Blue manages to connect with the pristis and the usual deadly effects of a stern ram ensue. 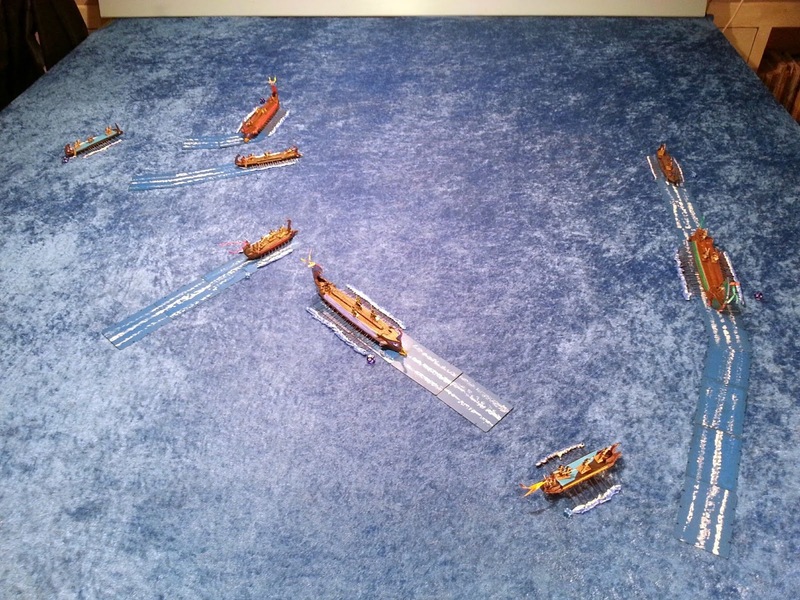 Final wide shot of the seascape. 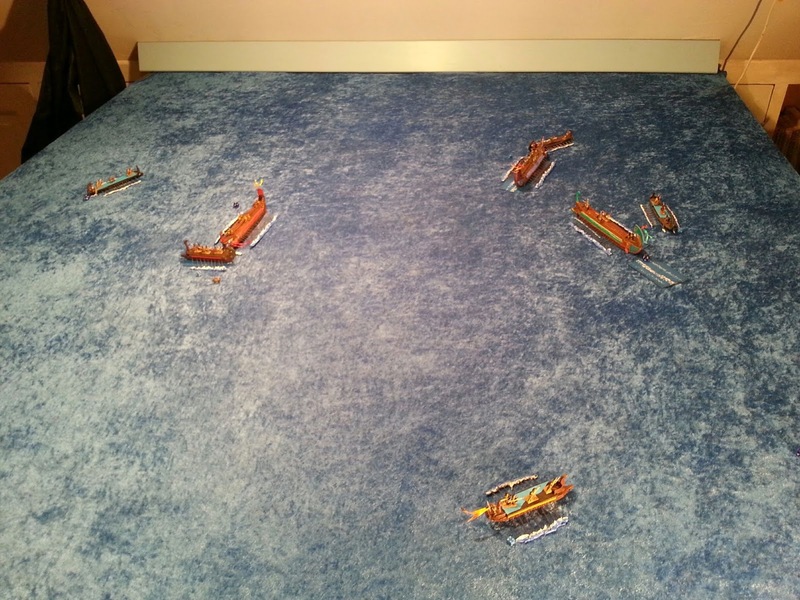 All five pirates settling in the water. 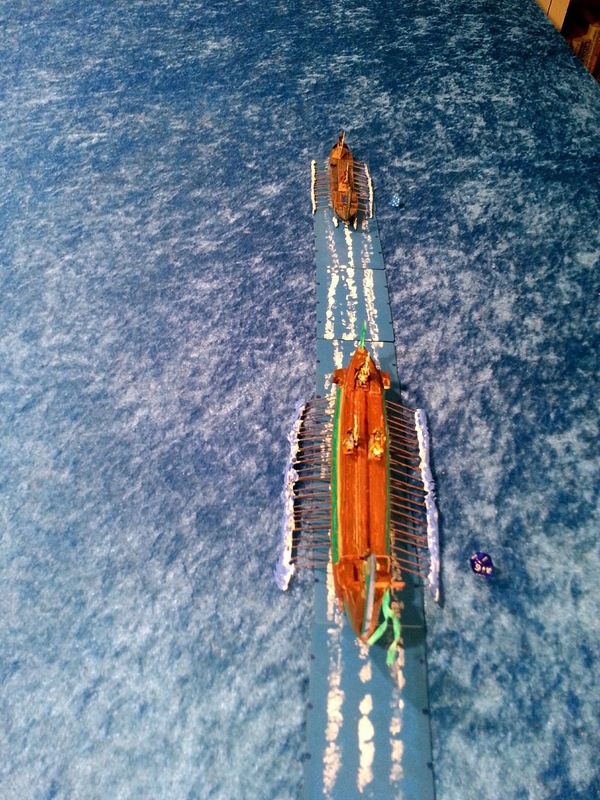 A last shot of blue taking the pristis in the starboard stern quarter. No deck fights were necessary. Few arrows or javelins flew and non found a mark. 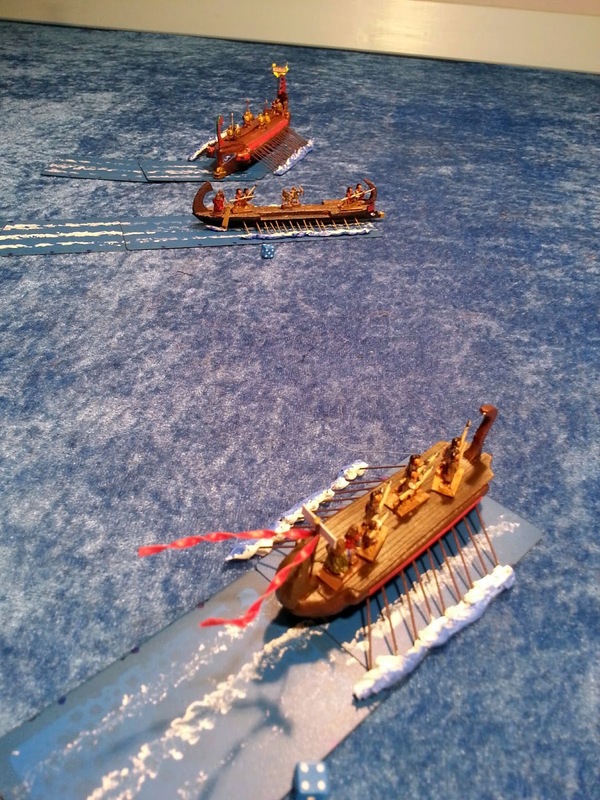 The trihemiolia proves to be a vicious war galley, second only to the Three in agility. 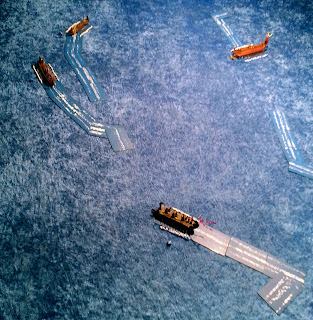 The pirates need a tactic better than 'run for the exit!'. Green and blue line up for attacks on the other group. A gap in the foto record here but we can see that up in the NW quadrant red successfully dashed forward and smote a pirate pristis with great force. Goodnight Vienna! bravely sang they with suspiciously Syrian accents as they went down. While Red did this the two others in the area tried to slip through the centre. 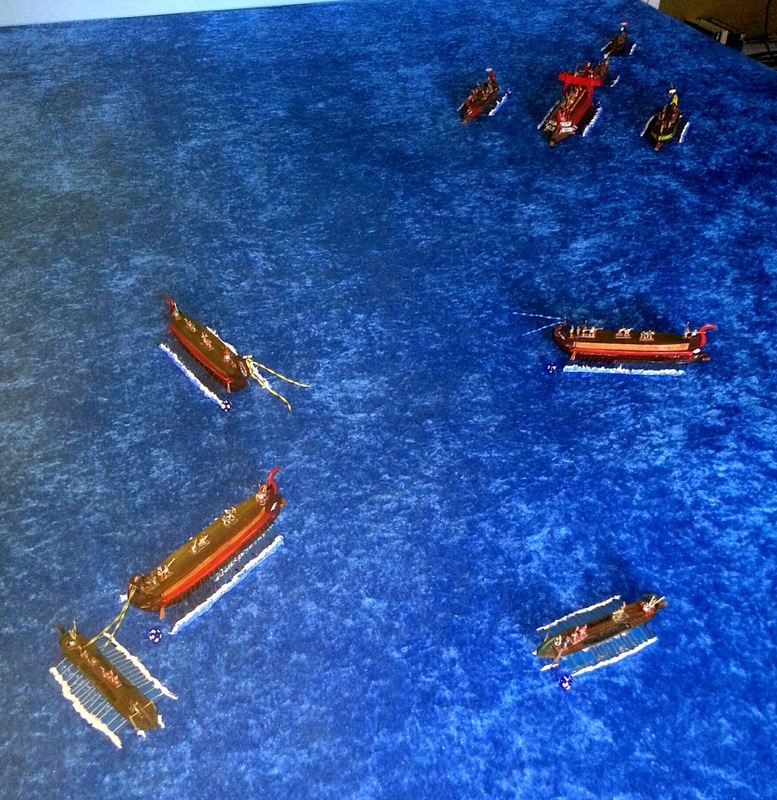 The Rhodians counter by Red slammiung into reverse and pulling round sharply to get in the fight again. 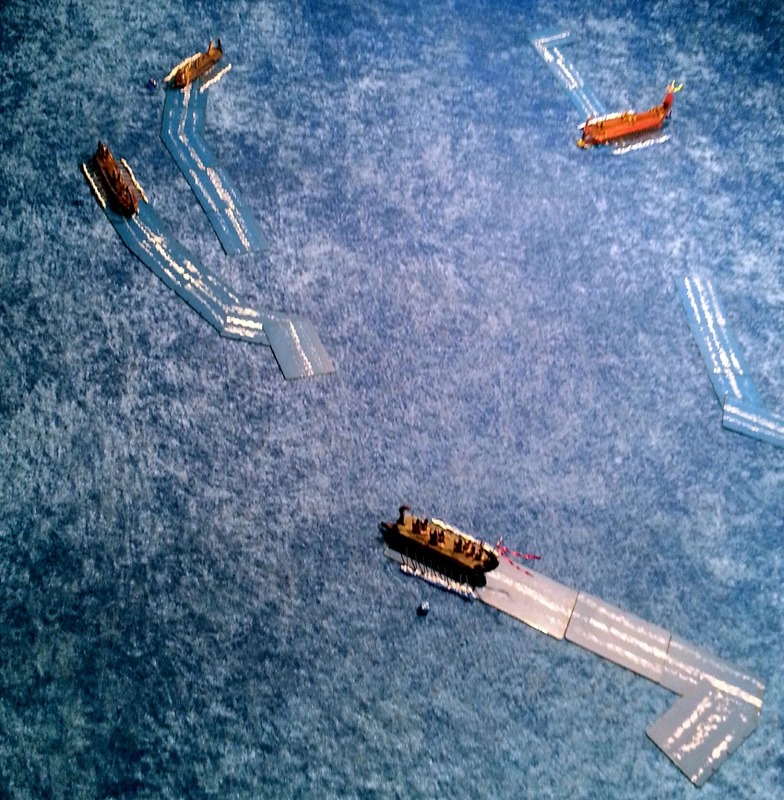 While Blue, flushed with victory also speeds astern toward the centre. 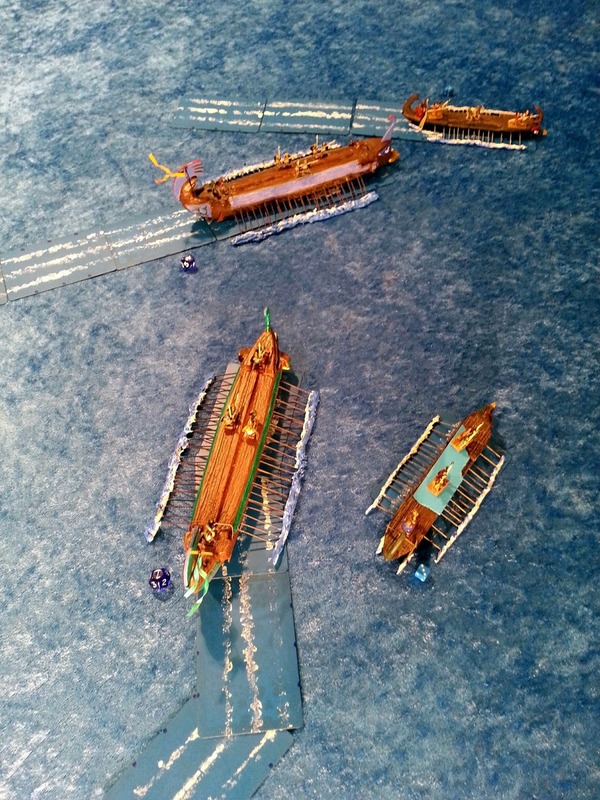 Meanwhile Green enjoys a flat-out race with the other pristis which tries to use all its rowers' available energy to stay ahead. But my obols are all on the trihemiolia. (streamers streaming nicely). Closer view of lembus and pristis trying to make a run across the centre. (streamers also streaming).